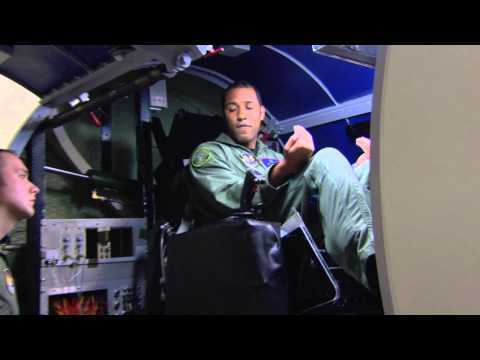 The professionals at the Brooks City Air Force Research Lab in San Antonio, Texas, are experts on the forces caused by acceleration, also called 'G forces.' That's what people feel in their stomachs when riding a wild roller coaster. But at Brooks City, they specialize in the more powerful forces experienced by fighter pilots. Fabric is made by weaving fibers into cloth - which is then sewn into the shirts and pants that you wear every day. Now, at the Army research lab in Natick, Mass., research chemist Kris Senecal is investigating ways to use the tiniest of fibers - called nanofibers - to help people stay healthy. 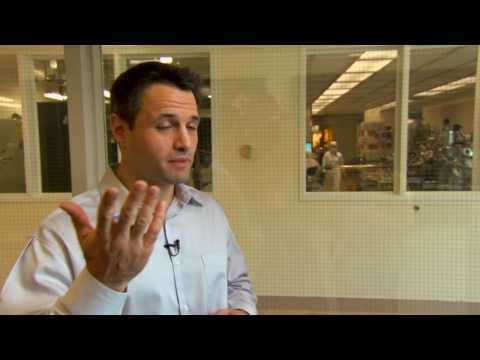 Each nanofiber is 50 times finer than a strand of spider silk. Scientists can combine these nanofiber webs, or mats, with antibodies that will capture germs and bacteria that could make people sick. Upcoming missions to the moon may include as many as 30 people at a time. Since having such a large group talking on a single voice channel is impractical, how can they more efficiently communicate? Naval scientists in San Diego are exploring answers to that challenge with special gloves that contain -- in each hand -- six of the feedback devices now being used in wireless remotes for the Wii video game system! Influenza is a formidable enemy. A leading cause of death in the United States, the disease kills more than 36,000 people each year. It's also tricky -- though the flu virus itself is a simple organism, it is able to fool our cells into making new viruses -- which makes us sick. 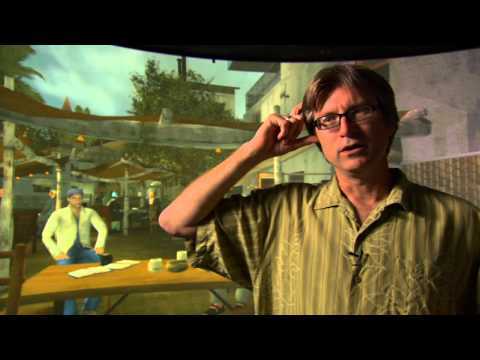 Using virtual human technology, scientists, programmers and graphic artists at the Institute for Creative Technologies in Los Angeles have created realistic environments featuring computer generated characters. These lifelike characters respond to your movements and answer questions within 250 milliseconds - real time for human conversation. What started as an Army training project is pushing the frontiers of virtual technology, creating ever more realistic interactions, even striving to add emotion. 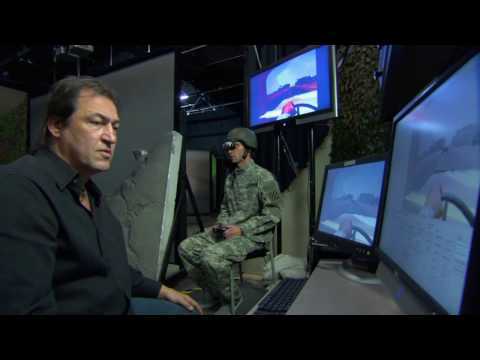 Using virtual reality environments, a psychologist at the Institute for Creative Technologies in Los Angeles is helping treat soldiers with Post Traumatic Stress Disorder. The video-game feel of this immersive technology may draw in people who ordinarily might resist coming to treatment and instead suffer for the rest of their lives. In one study, 80 percent of the patients made huge improvements. 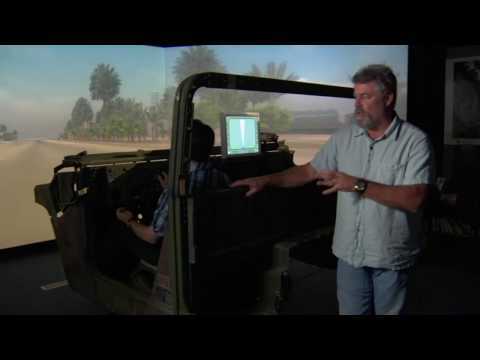 Inside a Navy lab, a soldier maneuvers a Humvee through a digital representation of Baghdad. The experience is amazingly accurate, down to the buildings, GPS coordinates and how the truck handles. At the Naval Air Warfare Center Weapons Division - China Lake, scientists, engineers, and artists partner with battlefield-tested soldiers and pilots. Together they create real-life simulations that take video games to the next level and plan real-time support for those in the field. 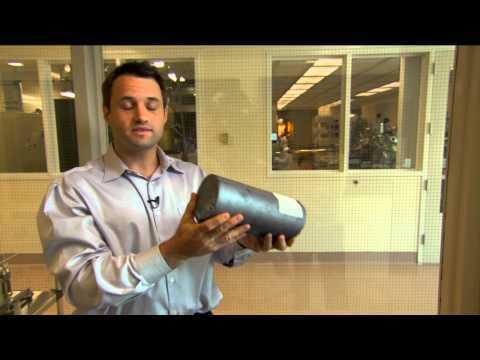 In one of the world's cleanest environments -- scientists and engineers at the MIT Lincoln Laboratory in Lexington, Mass. turn sand into tomorrow's semiconductors. It's an amazing process that takes silicon crystals, called boules, slices them into thin wafers and then builds millions of circuits -- that can run everything from computers to cell phones. This abundant element is a gem in the lab. Microelectronics is the creation of very tiny electrical circuits -- finer than a human hair. These circuits run everything, from computers to phones. Most are made out of silicon, a very strong and rigid crystal which can be sliced as thin as a wafer. By adding impurities to silicon -- they can turn an insulating material into a semi-conducting one and make "semiconductors." Scientists at the MIT Lincoln Laboratory in Lexington, Mass., are finding ways to make microelectronics -- faster, smaller, and less expensive. Knowledge and use of the Global Positioning System (GPS) technology has increased tremendously over the last several years. Though unknown just a few years ago, today hikers use it as an invaluable tool to help them figure out where they are. And it?s not just for hikers. The same is true for drivers, pilots, ship captains, firefighters and even parents hunting for an out-of-town amusement park or a restaurant.